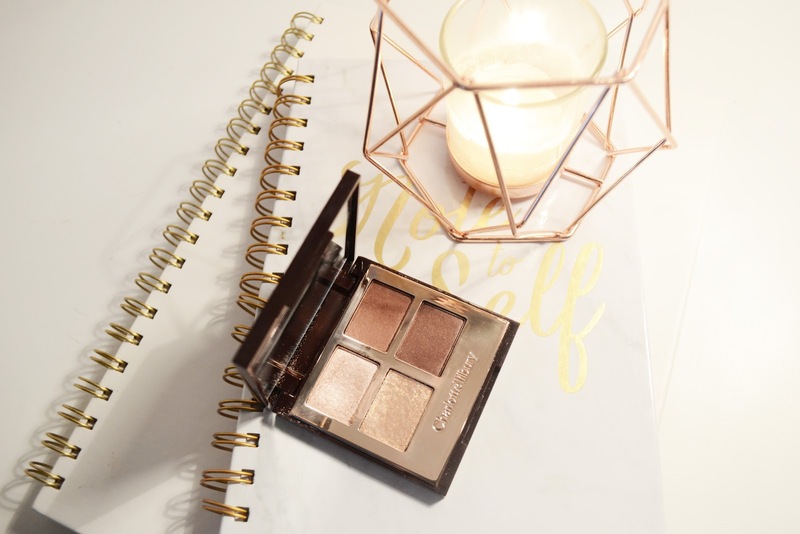 I have slowly started to love Charlotte Tilbury over the past couple of months and more so due to the beautiful rose gold packaging – bad, I know! But I cannot help it, I just seemed to get suckered in. Now would probably be a good time to mention that it is not only the packaging that is good but also the products themselves. I only have three make up items from Charlotte Tilbury and the quality is amazing. The product I want to write about today is The Vintage Vamp eyeshadow palette, this quad comes with four beautiful shades in this wonderful burgundy packaging and of course there are rose gold accents throughout. The back of the palettes highlights which colours and which and what the names of them are. Inside there is a large mirror, which is perfect should you be travelling. The first colour on the top left is the colour Prime, which is the perfect base shade. It has slightly pink pigments to it and are also shimmery. I love this colour mixed with the others but I use it mainly on it’s own on a daily basis. The shade is super creamy glides effortlessly onto the eye. It works well without primer but the colour is more intense when one is used. The second colour on the bottom left is the only colour I am slightly disappointed in. It is a gold colour with shimmer flakes to it, the problem I have is that the colour is hardly pigmented and I find I have to rub quite hard in order to get any colour. Whilst there is still colour, that is very pretty, for the price of the palette I would have preferred more pigmentation from the eyeshadow. The next two colours are more on the matte side but still have a tiny shimmer to them. The first, on the top right, is the colour Enhance and it is a burgundy colour with slight brown accents. It is perfect and matches well with the other two colours and I like to put it into the crease of my eye. The final colour is Smoke and it is a dark brown but still has a slight purple hint to it. I like to use this in the outer third of my eye to intensify a look. Although I hardly use these two colours they are extremely pigments and blend very well into the crease of my eye and with the other colours. Overall, I love this product and use it on a daily basis. It is just a shame about the gold colour. If you have this palette has the same happened to you?